Genetically modified "gene drive" mosquitoes feed on warm cow's blood. 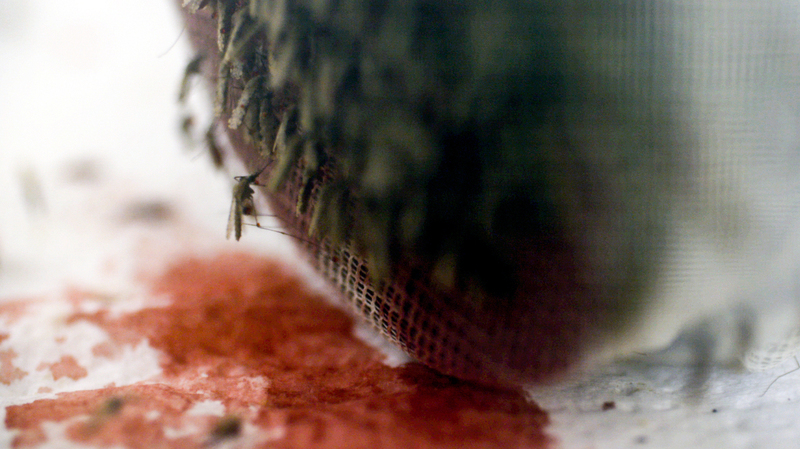 Scientists hope these mosquitoes could help eradicate malaria. "It's very exciting," Mueller says. 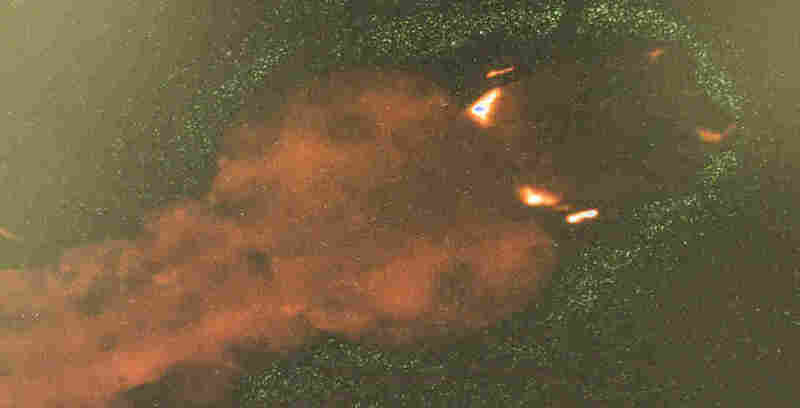 NPR was the only news organization allowed into the lab to witness the moment the releases began in early February. The lab was specially built to evaluate the modified insects in as close to a natural environment as possible without the risk of releasing them into the wild, about which there are deep concerns regarding unforeseen effects on the environment. "This is an experimental technology which could have devastating impacts," says Dana Perls of Friends of the Earth, an environmental group that's part of an international coalition fighting this new generation of modified organisms. To prevent any unforeseen effects on the environment, scientists have always tried to keep genetically engineered organisms from spreading their mutations. But in this case, researchers want the modification to spread. So they engineered mosquitoes with a "gene drive." A gene drive is like a "selfish gene," Mueller says, because it doesn't follow the normal rules of genetics. Normally, traits are passed to only half of all offspring. 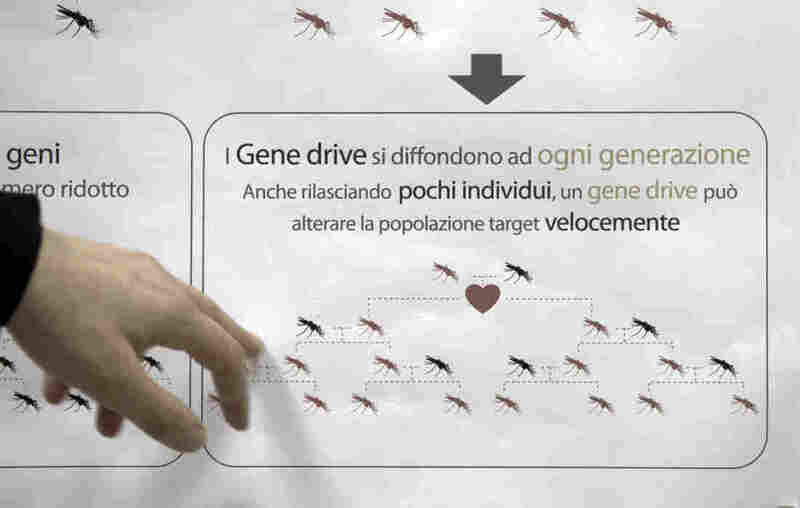 With the gene drive, nearly all the progeny inherit the modification. "All the offspring. All the children — the mosquito children — have this modification," Mueller says. 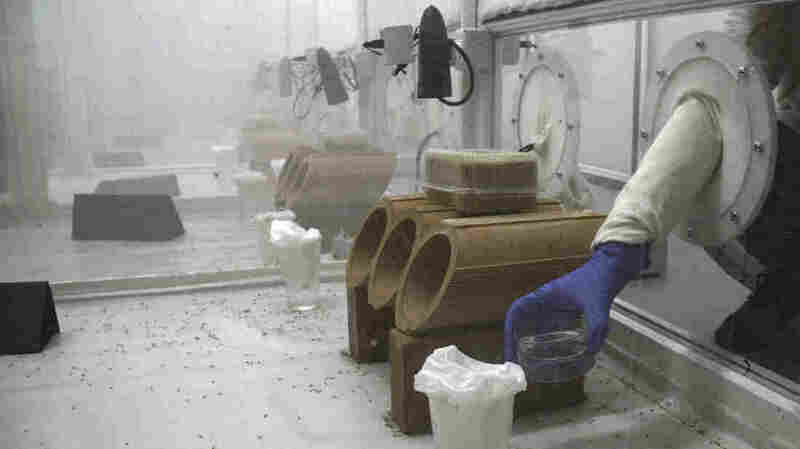 A technician begins the experiment by placing dishes containing dozens of modified mosquitoes in the pupal stage of development into large cages containing hundreds of their unmodified counterparts. Researchers created the mosquitoes by using the powerful new gene-editing technique known as CRISPR, which Mueller likens to a "molecular scissor which can cut at a specific site in the DNA." The cut altered a gene known as "doublesex," which is involved in the sexual development of the mosquitoes. "The females become a bit more male," Mueller says. "A kind of hermaphrodite." While genetically female, the transformed insects have mouths that resemble male mosquito mouths. That means they can't bite and so can't spread the malaria parasite. In addition, the insects' reproductive organs are deformed, which means they can't lay eggs. 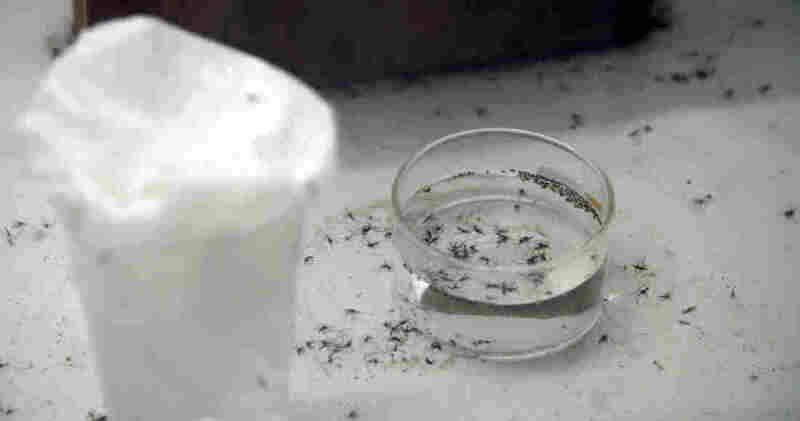 As more and more female mosquitoes inherit two copies of the modification, more and more become sterile. The idea is that if these modified mosquitoes are eventually shown to be safe and effective, they might someday be released in African villages plagued by malaria. The hope is that they would spread their mutation and eventually sterilize all the females. That would crash — or drastically reduce — local populations of the main species of mosquito that spreads malaria, known as Anopheles gambiae. "Malaria is a huge problem affecting probably two-thirds of the world's population," says Tony Nolan, who helped develop the mosquitoes at Imperial College London. He is now at the Liverpool School of Tropical Medicine. Malaria sickens more than 200 million people each year and kills more than 400,000, mostly young children. Scientists think gene-drive organisms could help solve many problems, including wiping out other insect-borne diseases such as Zika and dengue. Gene-drive creatures might also save endangered ecosystems by eradicating invasive rodents. They could help feed the world by creating more efficient crops. But critics fear that gene-drive organisms could run amok and wreak havoc if they were ever released into the wild. The insects could inadvertently have a negative effect on crops, for example, by eliminating important pollinators, they fear. The insects' population crash could also lead to other mosquitoes coming with other diseases, critics say. "We can't be taking lightly this extermination technology," Perls says. "We need to slow down. We need to hit the pause button on gene drives." Some activists in Africa agree. "This is a technology where we don't know where it's going to end. We need to stop this right where it is," says Nnimmo Bassey, director of the Health of Mother Earth Foundation in Nigeria. "They're trying to use Africa as a big laboratory to test risky technologies." The experiment is a key step in the Target Malaria project. The project's major funder is the Bill & Melinda Gates Foundation, which also supports NPR and this blog. Nolan and Mueller say the project is working methodically and cautiously to assess the mosquitoes in close consultation with scientists, government officials and local residents in Africa. In addition, the gene-drive mosquitoes would affect just one of hundreds of mosquito species. "There's going to be concerns with any technology. But I don't think you should throw out a technology without having done your best to understand what its potential is to be transformative for medicine. And, were it to work, this would be transformative," Nolan says. "If my kids lived in Africa, I'd say, 'Go for it as quickly as possible,' " says Kevin Esvelt, an evolutionary engineer at the Massachusetts Institute of Technology. Esvelt is a gene-drive pioneer who has repeatedly warned scientists to move cautiously with the technology because it is so powerful. But Esvelt thinks Target Malaria has been acting responsibly. "The known harm of malaria so outweighs the combined harms of everything that has been postulated could go wrong ecologically," Esvelt says. The project plans years of additional study to evaluate the mosquitoes and possible environmental impacts, as well as social and political consultations to build a consensus for when a release would be permitted. That's probably at least five years away, Nolan says. On the day NPR visited the Terni lab, Mueller demonstrated several layers of security at the lab to keep any mosquitoes from escaping. She noted that the experiment is being conducted in Italy, where this species of mosquito could not survive the climate even if the insects did escape. "We really want to show that we work very, very sound and responsible about this new technology," Mueller says. To enter the most secure part of the facility, Mueller punches a security code into a keypad to open a sliding glass door. As the door seals, a powerful blower makes sure none of the genetically modified mosquitoes inside escape. Anyone entering must don white lab coats to make it easier to spot any mosquitoes that might try to hitch a ride out of the lab and must pass through a second sealed door and blower. Once inside, Mueller points to a small container made out of white mosquito netting. Inside are dozens of mosquitoes. "Here we have gene-drive mosquitoes — these genetically modified mosquitoes," she says. The insects quickly crashed populations of their natural counterparts in small cages in a secure basement lab at Imperial College London. The new experiment is designed to test them in a hot and humid environment more closely resembling their natural habitat in the African countries where this species of mosquito lives. "This helps us understand better how a gene-drive release would work in the real world," she says. Mueller heads to a large, thick metal door. "We will now enter the experimental chamber where the release takes place today," she says. The chamber houses six huge "cages." The 9-foot-high cage walls are made out of white mosquito netting to keep the insects contained. The netting stretches from the floor to the ceiling. Each cage contains hundreds of unmodified mosquitoes. Every cage is equipped with several features designed to replicate the conditions in which the mosquitoes live in the wild. The idea is to encourage the mosquitoes' natural behavior. The cages' features include stacks of moist clay hollow cylinders for the mosquitoes to use as shelters. Also, large black boxes with white backgrounds are inside the cages. The contrasting colors stimulate swarming, which is when the mosquitoes mate. A computer precisely controls the light in the chamber to simulate sunrise and sunset and the natural changes in intensity and color throughout the day. "OK, we can start," Mueller says as several of her colleagues crowd into the chamber. After pulling on rubber gloves, lead technician Tania Persampieri carefully picks up a tray holding glass dishes, each containing dozens of the modified mosquitoes in the pupal stage of development. They're squirming around in water. Persampieri slowly walks over to the first cage, squats down and picks up one of the dishes holding the mosquito pupae. She gently slides the dish through an opening in the netting that prevents any insects from escaping and places the vessel on the floor. "The experiment has now started," Mueller says. "It's very exciting." Persampieri and her co-workers move quietly to avoid unnecessarily stressing the mosquitoes. Persampieri releases immature gene-drive mosquitoes in four of the six cages. Two cages receive amounts equal to 25 percent of the unmodified populations already in the cages; two cages receive amounts equal to 50 percent. The remaining two cages will be used for comparison and so don't receive any modified insects. Other technicians slide canisters of warm cow's blood into each cage. "We heat up the blood because this is attractive for the mosquitoes. They don't like cold blood. They want to have a living animal where they can bite in," Mueller says. As the researchers are finishing, the lights in the cage chamber start to dim. "It's a slow dimming and also a specific light color — very orange, very warm color — so that they really feel like [they're] having a sunset," Mueller says. That's key because sunset is when male mosquitoes start their mating dance. 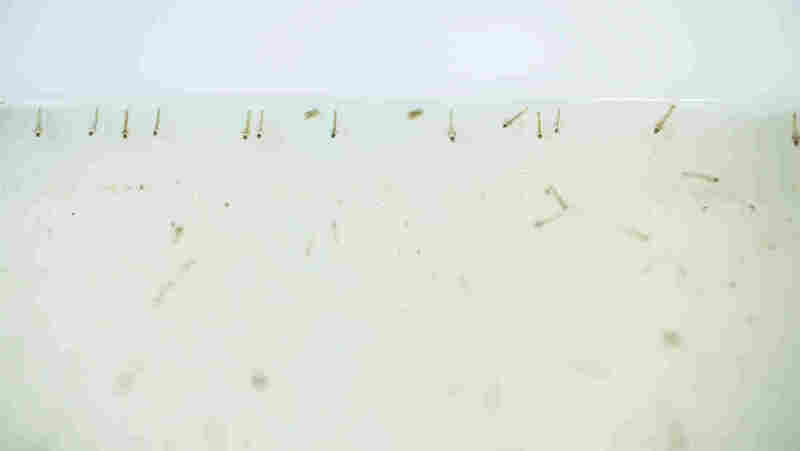 "The males make swarms — many mosquito males flying around," Mueller says. "It looks a bit like dancing." As the males swarm, females fly in and select a male; then the pair flies out to mate. "They couple and make babies," Mueller says. Mueller and her colleagues are collecting thousands of eggs from the cages every week to monitor how well the sterilizing mutation is spreading. The researchers hope to know within six months to a year whether the modified mosquitoes dance well enough to efficiently spread their lethal modification in the wild. "Maybe you can see already if you go a bit nearer," Mueller says, pointing to a few mosquitoes that have begun flying around inside the black boxes. Turns out, Terni is home to a shrine to St. Valentine. And the experiment is beginning just before Valentine's Day. So the basilica's annual Valentine's Day celebrations are just beginning as well with a church service at his shrine. As she watches the modified mosquitoes start their first mating ritual in her lab, Mueller muses, with a laugh: "It's very romantic." Do you have a question about this GMO mosquito experiment? Submit your question in the form below and correspondent Rob Stein may answer it in a story for NPR.